As an online business owner trying to make sure you’ve got the handle on your marketing, content, finances and all other tasks that come with being an entrepreneur, it’s so easy to try to focus on doing all the things. And let’s face it: you and I both know that it isn’t possible. Deciding to work on or focus on something means having to sacrifice something else or put it on the backburner, because you have limited time, energy and resources. And there are some things you just cannot outsource or contract out. But with all the ideas seeming like good ideas… how do you decide which to work on first? How do you know if it’s the one you should be working on? How do you know if it is a good idea or a great one? As with everything to do with decluttering and making sense of an overwhelming task at hand, the first thing to do is to brain dump all your ideas and thoughts on paper. This might seem like a duh move, but this serves two purposes, one, to clear your mind from residual tasks that are taking up brain space, and two, to make sure you never let a good idea slip away. Sometimes (or a lot of the time) we forget stuff because there’s just so many ideas and we don’t write them down. Brain dump everything on your mind, including to-dos, ideas for products, and ideas for blog posts or marketing content. Just clear your brain from all the ideas you’ve been hoarding. 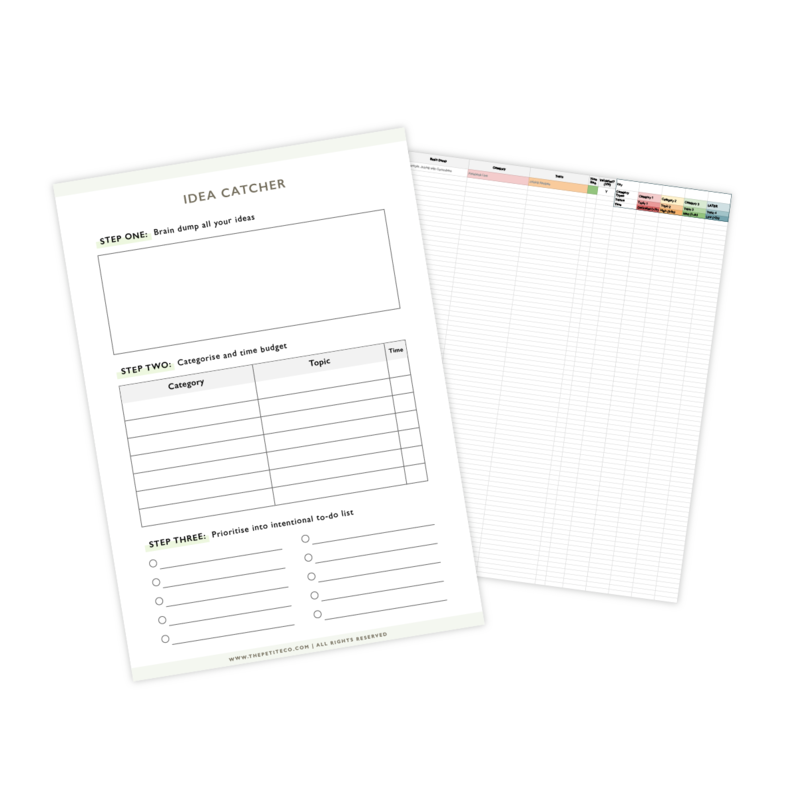 Get the Free Idea Catcher Templates! Organising by category is a two-step process. First, categorise them generally - so whether these ideas are just to-dos, improvements you want to make, a blog post, a content upgrade, a freebie, or a product or service. Then, sub-categorise them into topics that pertain to your business. What are the key topics or content people come to you for? You should have 2 to 4 main categories that you regularly write or talk about. Organise these ideas into their respective topics. For example, a social media marketing expert can write about expanding blog post reach with Pinterest, maximising Facebook Ad budgets and the best ways to utilise Instagram stories. A health coach can have topics like juicing recipes, latest health news and tips to use essential oils. If the ideas don’t fit into any of these topics, place them into the “later” column. You’ll just safekeep them until you have a bigger time budget or you want to work on something new. Next, go ahead and determine the time budget you have to work on an idea right now, and then classify each idea by the estimated time needed to complete the task. What this step does is give you a bird’s eye view and content vault of all the ideas that you have, so you can zoom in on the ones that are most relevant and also take you the shortest time to complete. So whenever you have some time to work on content, you know exactly which idea to pluck and execute immediately, skipping all that time spent contemplating and trying to sort out ideas from your brain (it won’t work, your brain doesn’t have folders!). Not all ideas are created equally - so while an idea can be on-topic and fits into your time budget, the idea might not actually produce the best results. When deciding which idea to work on, you can look down your consolidated Idea Catcher list and quickly sieve out the ones that will work in your time budget. Then, go through this quick list of questions and see if you answer “yes” to every one of them, or at least 3 out of the 5. If you do, that idea is good to go - it’s relevant, time budget-friendly, and will get you your best results. Can you have a quick win? Does it generate more sales / traffic (or whatever main goal you have in your business right now)? Have previous similar ideas produced good results? Are people talking about / having frustrations around this topic right now? Is it in your zone of genius? Basically, we are trying to figure out the time to result ratio. The higher the ratio, the more likely the idea will give you the best results for your time invested. Like the best bang for your buck! Doing the validation test with the questions give in the last tip again and again will help you quickly build a to-do list. Not just any to-do list, but one you can prioritise easily by listing them from highest ratio to lowest. This way, whenever you get some time to work on content, you immediately have the next best thing to work on. No time wasting trying to figure it all out or just throwing spaghetti at the wall hoping that it sticks! Nope - you have a clear and concise to-do list every single time. Just one small reminder: you have the option to pivot at any time. If you start working down your to-do list and realise that some ideas take longer than you initially anticipated, go back, modify the Idea Catcher document, and then relist the item according to the time-result ratio. Or, if an idea wasn’t as much in your genius zone as you thought it initially was, move on to the next one and archive it till you have more time! Also, if business goals or focuses change, just update your Idea Catcher list and to-do list accordingly. It is THAT simple! Your systems and methods should be as flexible as your business is, because things change and that’s okay. As my mentor Amber McCue likes to say, test, tweak and pivot! What ideas have been hogging up brain space and isn’t getting done? Did you try this process, and if so, did it work for you? If not, what systems best work for you right now?